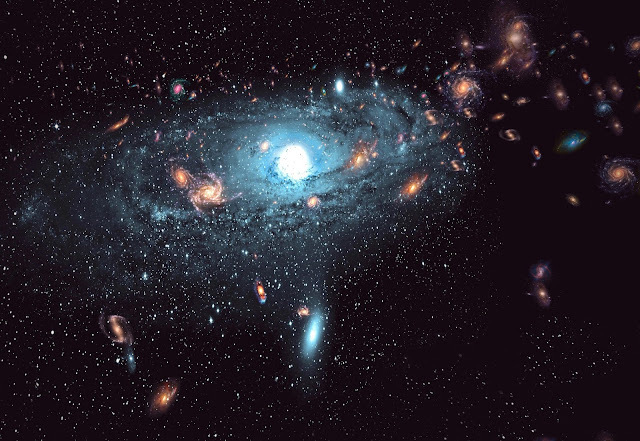 The large galaxy in this, artist's, computer-generated image, is the Milky Way galaxy. All of the other galaxies shown, are either being swallowed by it or are hidden by it. They were revealed using the CSIRO's Parkes radio telescope by non-visible radio imaging, by the University of Western Australia's ICRAR (International Center for Radio Astronomy Research) program and lie in a region of space known to astronomers, as, the "Zone of Avoidance" (well, yeah, for obvious reasons!). Artist's computer-generated image of the Milky Way Galaxy. The Milky Way galaxy, itself, was not formed by standard galaxy formation theory; rather, it is an aggregation of interacting (no one is yet sure how many), formerly individual galaxies.